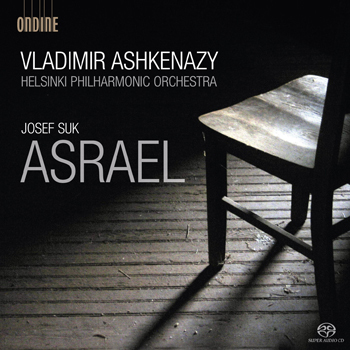 Everyone should hear Asrael - and Ashkenazy makes a persuasive case. Ashkenazy uppoutuu teoksen traagisimpiin syvänteisiin, HKO taitaa tuloksellisen antautumisen taidon. The hi-res surround sonics of the live recording are exemplary, and as perfectly suited to Suk's music as the many SACDs of both Bruckner and Mahler symphonies have proven. Within seconds of sliding this CD into my hifi system and hitting the play button, I knew it was going to be special. Suk's Asrael symphony is a true one-off and shines in this performance. (...) If Asrael is Suk's masterpiece, then here's a recording to match it. Ashkenazy brings more sheer excitement to the finale than any other conductor on disc, and the playing of the Helsinki Philharmonic is splendid. Ashkenazy also benefits from the best engineering (...). If you love the symphonies of, say, Mahler or Tchaikovsky, then you really must hear "Asrael." Despite its tragic programme, the symphony is an uplifting memorial, full of romantic fervour and richly orchestrated. Vladimir Ashkenazy and the Helsinki orchestra give a searing account of this neglected masterpiece. Dies ist nichts weniger als die lange überfällige Referenz-Aufnahme. (...) Eine grossartige Aufführung und ein Muss für den Liebhaber und Sammler! (...) Asrael-Sinfonie ist ein Meisterwerk, das den besten Sinfonien von Bruckner oder Mahler ohne weiteres an die Seite zu stellen ist. The recording of the 'Asrael' Symphony is another triumph for the Helsinki Philharmonic Orchestra. This masterpiece of late Romanticism is superbly recorded in multi-channel sound. This performance is magnificent. (Ashkenazy) brings more sheer excitement to the finale than any other conductor on disc, and the playing of the Helsinki Philharmonic gives nothing away to the Czechs in the Talich and Neumann versions. Ashkenazy also enjoys far and away the best engineering (...). If you love the symphonies of, say, Mahler or Tchaikovsky, then you really must hear Asrael. This neglected rarity has Mahlerian breadth and impressionistic colour for both of which conductor Ashkenazy has always shown instinctive affinity. The performance has drama and impressive emotion. It has rhetorical scope and fine, if not impeccable, instrumental playing. "I was saved by music," wrote Czech composer Josef Suk about his 'Asrael' Symphony, a work born out of tragedy and the loss of his teacher Antonín Dvořák in 1904. While composing the first part to a funeral symphony titled after the biblical angel of death who leads souls of deceased to the land of eternal blissfulness, Suk also lost his wife (Dvořák's favorite daughter Otilie). As a pupil and son-in-law of Dvořák, Suk's compositions reflect Dvořák's influence and contain many elements of Bohemian folk music. Suk's greatest work remains a masterpiece of the late-Romantic repertoire which can easily be compared in scope and emotional range to Bruckner and Mahler. Vladimir Ashkenazy conducts the Helsinki Philharmonic Orchestra in a masterful and intense performance of this deeply moving work, which has never before been released in super audio quality. Scholar Jan Smaczny who is an expert in Czech music contributed the booklet liner notes.